As my final year in SLU’s AT program comes to a close, I have been given the opportunity to spend my last semester at Webster University. Webster is a small private college located in Webster Groves, a suburb of St. Louis. Webster has a variety of sports including women’s volleyball, soccer, basketball, cheerleading, tennis, baseball, softball, cross country and track and field. The athletic trainers at Webster are Jenny Popken ATC and Martin Fields ATC. Throughout the whole year I have been working closely with them and absorbing as much knowledge as I can. Webster has provided me with many learning opportunities. Each day I am able to continue working on a variety of my skills. Some the skills I have been able to work on the most are evaluations, rehabilitation programs, electrical stimulation, ultrasound, taping, wound care and first aid. Martin and Jenny have worked hard with me on athletic training skills and have progressively let me become more and more involved. Martin and Jenny are always asking me what I want to learn about and take the time teach me what it is I want to learn. In addition to this, they are always evaluating me and provide me feedback or teach me something that they think would be useful in my future. 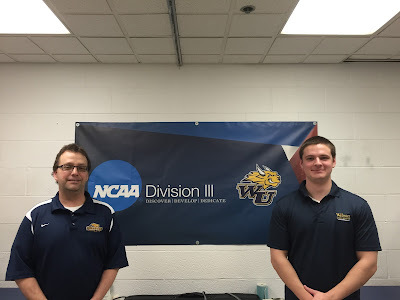 I am thankful for the opportunity to learn from the Athletic Trainers at Webster University. They have taught me more than I could have hoped for. I am looking forward to the remaining time I get to spend at Webster and being able to soak up as much knowledge as I can.